The appealing shape of Half Round Gutter is largely self cleaning and has a good water carrying ability due to its wide 150mm diameter. 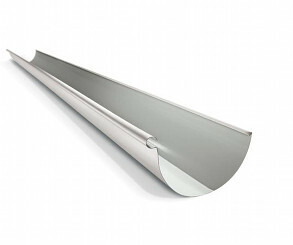 Half Round Gutter is particularly suitable for Spanish, Tuscan, and modern style homes. However, it has also been fitted to many industrial and office type buildings because of its clean, smooth shape and practicability. Because there are no square corners to gather silt and debris, a half round gutter is largely self-cleaning and usually more efficient than most other fascia gutters. It empties water faster because it has greater water carrying capacity than many other gutter types. The half round gutter efficiently channels even the smallest amount of water to the centre of the gutter for disposal.